We admit that the brand name did give us a chuckle, but their products are awesome. We all know that traveling with our bicycles can be a hassle, and there is always the fear of it getting damaged. Thanks to the Douchebags The Trail Bike Travel Bag, that will never be a problem again. Designed for simplicity, and containing attributes of a hard shell, with the lightweight compatibility of a soft shell, the The Trail is one of a kind. The Trail by Douchebags allows you to easily transport your bike to where you want to be. 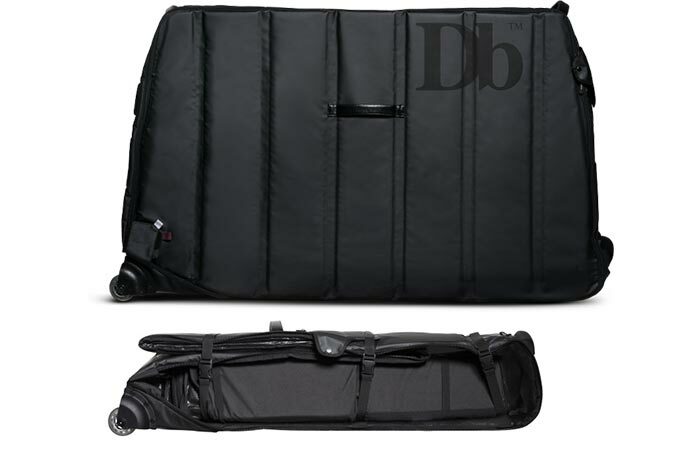 It also features a patent-pending rib cage protection that has been combined with a unique 3 panel design. All of this to ensure that your bike travels safely with you wherever you want to go. When your journey is over, compress it into a storage friendly size. It also fits a road bike, triathlon bike, an XC, FR, downhill bike, and other 29-inch bikes. Check out the video below. When not in use, simply compress it for easy storage. The Trail measures 3.2” deep x 9.8” wide x 51.5” high and has an astonishing capacity of 340 liters. It also only weighs 19.6lbs. The outer shell has been constructed from Polyester 1680D and neo/polyester 500D non-PVC tarpaulin. The inner, on the other hand, features polyester 750D and tarpaulin PE that has been combined with honeycomb board and PE foam. You also get a frame pad and inner foam bottom bracket block included with The Trail. Check out some of the bicycles that we have here.